The 'Buses' area allows you to add a bus name and number which can then be allocated to chosen students in the extended area of their pupil profile. The first step is to add the bus name and number by using the Add New function. Click Insert to save the changes. 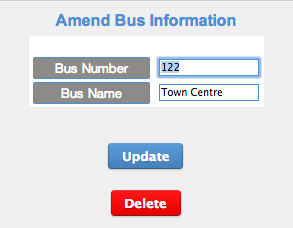 If you have existing buses stored and wish to make changes, select the Edit button to update the information or Delete to remove an entry. The bus description will appear in the Student Profile under the Extended tab. A report is available in Reporting>Reports>Student Travel which displays which number bus a student travels to school on.